Randal Birkey was contracted by the Memphis Arts Council in the 1980’s to create a fun map for use in a promotional poster. 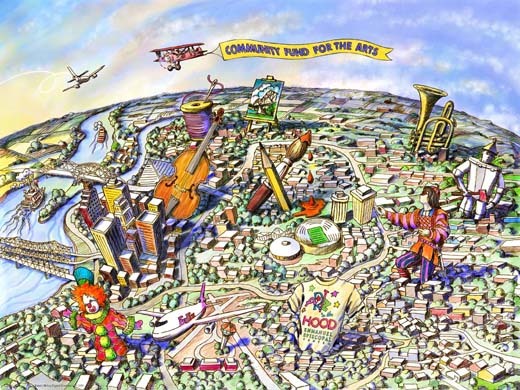 The map was intended to highlight a number of locations in the city where arts-related activities and events were being promoted. Randal worked from maps, drawings and aerial photo references of the city to create this “rounded earth” forced perspective view. In each location, one single element was selected and exaggerated to communicate the basic art events: music, dance, theater, etc. Randal used a cutting-edge software product at the time called Fractal Painter, running on a Macintosh computer with a Wacom tablet. This image was produced entirely digitally with nothing scanned or hand drawn on traditional paper surfaces. The final image file was delivered to the customer via email, and the printer went directly to CMYK film separations and printing plates from the file. It was reproduced in 4-color offset printing as a fold-out poster.